Brainstorm: Is Our Parenting & Teaching in Crisis? What We Can Do About Kids Failing to Be Kind. "In seventh grade, this new kid joined our class. In the interest of confidentiality, her Convocation Speech name will be “ELLEN.” ELLEN was small, shy. She wore these blue cat’s-eye glasses that, at the time, only old ladies wore. When nervous, which was pretty much always, she had a habit of taking a strand of hair into her mouth and chewing on it. So she came to our school and our neighborhood, and was mostly ignored, occasionally teased (“Your hair taste good?” — that sort of thing). I could see this hurt her. I still remember the way she’d look after such an insult: eyes cast down, a little gut-kicked, as if, having just been reminded of her place in things, she was trying, as much as possible, to disappear. After awhile she’d drift away, hair-strand still in her mouth. Now, why do I regret that? Why, forty-two years later, am I still thinking about it? Relative to most of the other kids, I was actually pretty nice to her. I never said an unkind word to her. In fact, I sometimes even (mildly) defended her. Those who were kindest to you, I bet……. What struck me about this, was that this child could have been Tom or you or me. And Saunders, 42 years after witnessing Ellen's bullying, is still thinking about how he could have been kinder. Each one of us, probably remembers a child in the playground like Ellen or spent some or all of our school years as Ellen. Did we make her life difficult or did we reach out with kindness? Snide remarks, exclusion, ignoring and gossip start early. By 7th grade some kids have perfected their quick jibes, trip of the foot or Facebook nasties. In fact with the expansion of the internet the ability to spread negativity without accountability has become easier than ever. And children are suffering. Suffering so greatly that they are making decisions that the world is better off without them. So much of the taunting, bullying and ignoring takes place on the asphalt, out of the sight of adults who have the 'whole' picture of their students' strengths and vulnerabilities. But it is absolutely essential that we as parents and the teachers in our schools support the Ellens and Toms in our care and teach our children to be kinder, starting when they are young. So how can we teach our children to be kinder? Adam Grant a professor of psychology and management at Wharton, in an excellent article about raising a moral child, explains that surveys show parents place much greater emphasis on wanting their children to grow up compassionate and kind, than on their academic achievements. "Despite the significance that it holds in our lives, teaching children to care about others is no simple task. In an Israeli study of nearly 600 families, parents who valued kindness and compassion frequently failed to raise children who shared those values." Grant discusses 2 major techniques, backed up by research, that can teach our children the art of kindness. 1. In the case of building character, Grant explains that, "Praising character is more important than praising actions when it comes to forming identity." Grant writes that, in forming identity, the following kind of feedback is most effective. You are a great helper, rather than you helped a lot. all helps children to build their identities and learn about their character. This is in complete contrast to the kind of language, researchers and parenting experts suggest parents use when it comes to supporting academic and other life challenges. Carol Dweck professor of psychology at Stanford stresses that praising effort rather than intelligence or character is key to academic confidence and success.. For example "You worked hard on that project" rather than "You're so smart." It turns out that HOW we praise children needs to vary according to the expertise we want them to acquire. 2. Role modeling kindness to children is much more effective than telling them to be kind. Grant sites a classic experiment, in which the psychologist J. Philippe Rushton showed that " Children learn generosity not by listening to what their role models say, but by observing what they do." When the researchers checked back with the students two months later they found the children who had initially seen kindness modeled in action by the adult, (rather than just being told how to be kind,) were the kindest when they were tested again. Those actions were retained and absorbed into the children's own actions. I believe we need to specifically teach and model compassion and empathy, from our children's early years and not just hope they imbibe it by osmosis along the way. It is excellent to take our children to serve at homeless shelters and encourage them to raise money for causes they hold dear. But I really believe that we will help them develop kindness by role modeling every day kindnesses, well... every day. We can role model kindness, by the way we interact with the doctor's receptionist, the grocery checkout person, the waiter and the Starbuck's barista. We can role model kindness by holding a door for someone, giving up our seat on the metro, helping someone who seems lost. We can take an extra minute in front of our children to ask how someone is and wait for the answer. We can invite new families to our neighborhood, over for coffee or tea and their kids to play and show our kids what kindness entails. At the dinner table we can role model how we respond to our spouse, how we discuss peoples' actions and how we express our thoughts about our children's teachers, doctors, coaches and peers. They will imitate how we do this. Are we respectful and kind about these people or belittling and critical? And if we are parents or teachers of one of these children who do not feel kindness from their peer group,we need to advocate strongly for them when they are very young and keep communication open so that they will tell us when things are tough, as they grow older. We helicopter parent about grades and homework and reading, but if children are unhappy socially, learning just doesn't happen. One child's flippant comment, in person or via the internet can spoil another child's whole day and that's where the teachers in our schools can partner with us and many of them do. Tom's parents needs to advocate for Tom. Since Tom's teacher doesn't do playground duty, she may have no idea what is happening there. Tom's parents need to ask her to organize a rosta of children to take turns to be with Tom at break time. The teacher needs to explain that the rule about the crutches comes from the school, so that Tom is not the arbiter of who can use his crutches. She needs her students to know it is a priority for her that they are kind people, helpful, supportive and inclusive with each other in the classroom and out on the playground. The message is clear and she will follow through and be disappointed if they fail to be kind. Kindness can and indeed must be learned. Not just for Tom's sake. Not just for Ellen's sake, but to ensure that all our children understand and practice the values of kindness and compassion that we purport to hold most dear. We can all do this, by praising our children, grandchildren and students when they demonstrate kindness and by modeling kindness ourselves, on a daily basis. Who do you remember in school, was kindest to you? What did they do? How did they help you feel less alone? 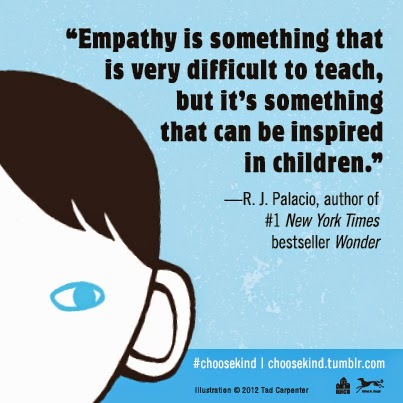 Has your child or grandchild or student experienced failures of kindness? What and who helped them most? PS. 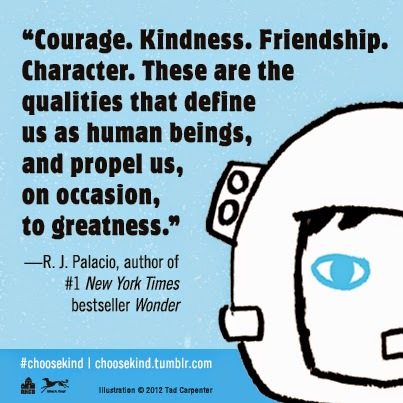 The quotes on this page come from the incredible teen's book Wonder by R.J.Palacio,(link to it is on the RHS) which should be required reading for all ages! Read it yourself, give it to your child and discuss the failures and successes of kindness, raised in this powerful novel.Let me know what you think…..
PPS. Do you love this blog? Don't miss a post. Subscribe with your email and it will come to your inbox every time I write a new post.. I especially found enlightening the advise to praise the kid's kind nature as opposed to (or in addition to) his/her kind actions. Yes, that was such an interesting piece of research. It seems that the more we finely tune how we adults role model and feed back,the greater success we will have in imparting, to our kids, what we believe to be positive values, behaviors and habits. Melanie, I'm so glad you are enjoying the blog posts. Thank you for your feedback and for your comments. I really believe that the conversation after the post helps to bring the messages to life. I am looking to expand my readership. Since you are enjoying the blog, do you have any suggestions as to how I might expand my reach? would you be interested in sharing your blog, or amending it slightly to be a featured blogger on the YU community of practice- YUEducate- (http://yueducate.com/)? Really great article Gilly. I'm blessed to have an 8 year old who we started to home school, but due to health issues we had to get him into school. But his attitude and behaviour is still very different to his peers. Harry has compassion and a kindness that appears to have been knocked out of other kids. A new girl was starting in his class after Easter Break and he took her a little something to welcome her and he told her he'd play with her until she 'didn't feel lonely any more'. I honestly think, that not being in the education system at all until the age of 6 (even missing pre-school/kindergarten) and going to home school groups gave Harry a completely different start in life. He makes me proud almost everyday. Your message of kindness is one that I hold dearly, and I'm glad for the most part, I am doing and saying the right things to encourage kindness within my children. I hope other parents will read or listen to this article, I will be sharing and pinning. So true. What a beautiful message that every parent should read! Thank you!